I have so many comics now (252) that finding one in the archive is getting hard, even for me. And what if you want to find all the comics that have Science Frog, or Pirate Frog? It's not easy. How many comics have embedded games? Who knows?!? To correct this problem, I've decided to add tags to all the comics. Whenever I make a new one, I'll tag it with the characters, the theme, a special feature, or whatever else makes sense. You'll be able to see these tags at the bottom of the comic. Like all tags these days, they'll have # in front of the word. Clicking on one of the tags will take you to the archive page, filtered to just show the comics with that tag. I'll also be able to put a filter link directly on the Archive page, so you can find comics that contain a search term or have a common tag such as "#game" or something. These are exciting times for frog comic lovers everywhere. 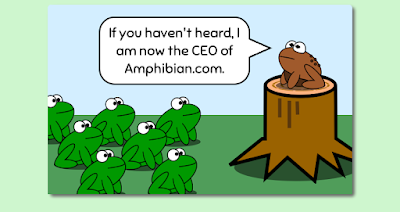 Of course, these new features aren't available yet on the public version of Amphibian.com, but they will be soon. I'm still working out some things, but I'm also sitting in a hotel room in Dallas this week. I can never seem to be as productive when I'm away from home. You can still view today's comic without the tags at the bottom; just follow the link below.